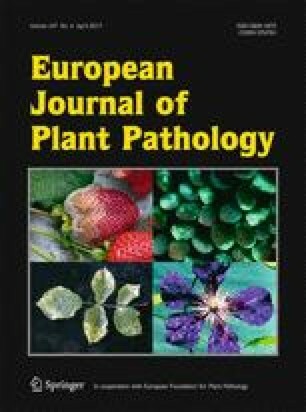 Leaves with typical symptoms of downy mildew were found on common agrimony in the Czech Republic in 2014 and 2015 and at several locations in Germany from 2010 to 2014. The causal agent of downy mildew of agrimony was often reported as Peronospora agrimoniae, but sometimes also as P. sparsa. Morphological characteristics of the pathogens found in both countries are in the range of previous works for P. agrimoniae, but also other downy mildews parasitic on Rosaceae, rendering their discrimination based on published observations difficult. For molecular identification sequencing of several loci (nrITS rDNA, cox1 and cox2) was performed. Phylogenetic analyses based on nrITS rDNA clearly separated P. agrimoniae from other Peronospora species infecting Rosaceae. Thus, considering P. agrimoniae as separate species seems justified. Two German specimens were identical to two Czech samples in both nrITS rDNA and cox1 mtDNA sequences, but differed in a single nucleotide substitution in cox2 region. To our knowledge, this is the first verified record of P. agrimoniae on common agrimony in the Czech Republic. The online version of this article (doi: 10.1007/s10658-016-1058-8) contains supplementary material, which is available to authorized users. Research was supported by: grant No. LO1204 (Sustainable development of research in the Centre of the Region Haná) from the National Program of Sustainability I, MEYS, Czech Republic; Internal Grant Agency of Palacký University in Olomouc, the Czech Republic (IGA 2016-001); fellowship from the Alexander von Humboldt foundation; LOEWE, Landesinitiative zur Entwicklung wissenschaftlich-ökonmischer Exzellenz, a funding program of the Government of Hessen, Germany, in the framework of the IPF—Integrative Fungal Research Cluster and the BiK-F—Biodiversity and Climate Research Centre. Authors thank to Prof. Aloisie Poulíčková for providing DIC microscopy photograph of P. agrimoniae conidiophore. Farr, D. F., & Rossman, A. Y. (2015). Fungal databases, systematic mycology and microbiology laboratory, ARS, USDA. http://nt.ars-grin.gov/fungaldatabases/. Accessed 2 Jul 2015.